OMG Posters! 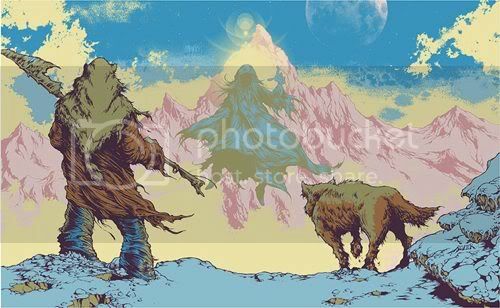 » Archive "The Sighting" Art Print by Arik Roper (Onsale Info) - OMG Posters! Arik Roper is truly one of my favorite artists, so it is my pleasure to bring you this news. If you haven’t heard his name before, you’ve probably seen his art anyway, as he has done the album artwork for a load of amazing “heavy” albums. 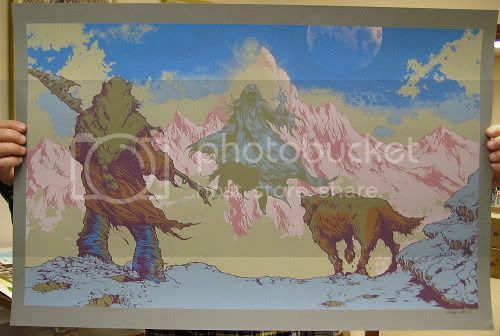 He has teamed up with Burlesque Design to release this hazy, psychedelic, massive, epic new art print, “The Sighting”. It’s a 24″ x 36″ eight color screenprint, has an edition of 80, and will only be $50. These drop tomorrow (Thursday, January 29th) at 2pm CST. Visit BurlesqueDesign.com. Also, Postersandtoys.com will have an exclusive Steel Blue edition. The 24″ x 36″ size is the same, but this one is limited to a mere 30 pieces (actually, only 20 will be sold to the public). They will drop half an hour later (Thursday, January 29th at 2:30pm CST) for $70 each. Visit Postersandtoys.com. Love it. His stuff reminds me of Rodney Mathew’s stuff from the 70s. Yes, very retro. Awesome work! His site has a lot of stuff on it. This is incredible! Colors are fantastic. Any one want to sell or know where i can locate one of these gems?